The thing I'm learning about sourdough starters is how robust they are. Here's a quick tale and I'll eventually elaborate this to try to prepare it on a weeknight. I took my starter out of the fridge yesterday morning. The dead looking thing had liquid on top and a claylike sediment. Probably weighed about 50 grams. I poured off the liquid and added water (ca. 100 g) and swirled it until the suspension was homogenous. Then I added about 125 grams of flour and stirred it up into a thick batter. It was bubbly within hours. That night, I took 200 grams of this starter, diluted it with 300 grams room temperature tap water (300 grams) and swirled to get a homogenous suspension, poured it into my bread machine and added 500 grams of flour. About 350 grams unbleached white and then a mixture of rolled oats, oat bran, spelt flour, rye and wheat to get up to the 500 grams. Then let it knead in my bread machine about 5 minutes and let it rest. After about 10 minutes, I added salt (10 grams) and let the mass knead in the machine an additional 15 minutes. It was a pretty stiff ball. I dumped it on the counter. Total weight, about a kilo. I put it into my rising container and let it rise overnight (about 8 hours) until it grew to about 2L in volume. I sprinkled it with flour, punched it down, rounded it and let it rest an hour and went shopping. Then I did the same thing. Punched it down, rounded it and put it in my heavily-floured brotform proofing basket covered with a dish towel to let rise (about 2 hours). Looked almost doubled. I preheated my oven, dumped it onto a perforated baking sheet, scored it and placed it into a 425-deg-F oven to bake for 45 minutes. 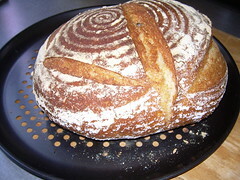 Final weight, 800 g. What a crust! I think the best part of whole grains as part of the flour make-up (ca. 20-30% by weight) is how robust the fermentations can be. No sluggish rising for this yeast-free loaf (no added commercial yeast anyway). The final loaf was light, the crust crisp and near perfect. A great bread for tonight's gorgonzola and salad. Bread, cheese and salad nights are our absolute favorite meals. Simplicity. I'll be doing the same thing over weeks to come but feeding the starter and doing the main fermentation of the dough in the fridge over a couple days and doing the final proof at night to have a steady and predictable supply of good bread during the week. Unfortunately, a boule's so large the cool-down time is lengthy and we won't be able to eat the goodies until the next day. Maybe that's no so bad. Poilâne thought his breads were best on their fourth day! I don't remember where I read that but I'll look and get back to you.